This was a really full weekend. It started off on Friday after work with a staff Christmas party. Normally these events are rather dull and boring but this one was a riot. My boss was pouring shots and having people pass them out. Very funny stuff. And no, I was not dressed pretty, but it was still fun. Oh, but yeah my fingernails were painted in a holiday theme - Red with two accent nails with gold sparkles on them. Cute! I had totally planned, after these two work related events, to dress up nice on Sunday and go get my nails done and maybe catch a movie. It was something I was planning on that helped me to get through the week. 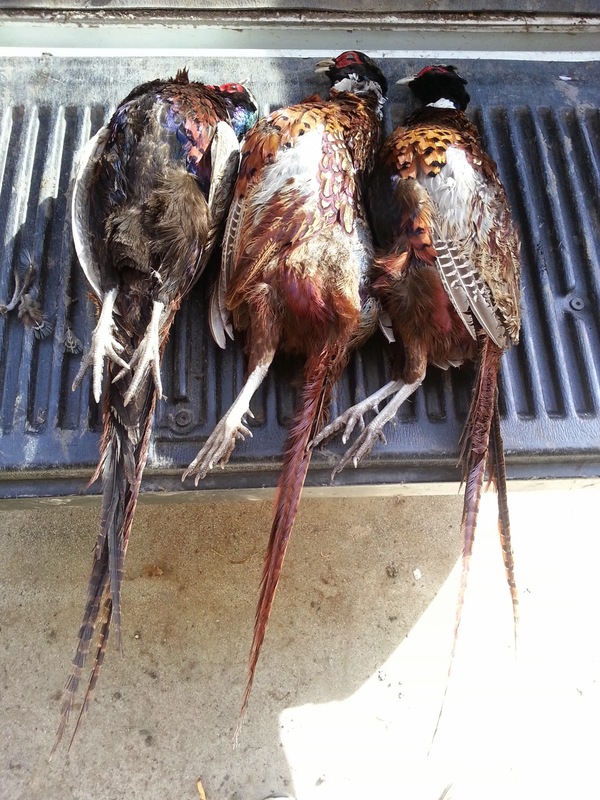 But as luck would have it, on the way home from the duck field my boss invited me to a pheasant hunt on Sunday. I have walked that field hundreds of times and have come back with nothing! Only twice, maybe, have I ever gotten a pheasant. But this time we would be going out with the guy who planted the cage raised pheasants. It was a hell of an opportunity. But it meant deciding between my divergent desires. From the picture on the top of the page, you can tell which choice I made! Thus I have no new outfit picture to post. But I did have a great time and I was happy for taking advantage of the opportunity that life provided for me. It was not what I had planned for, but as I said, I was still quite happy for doing it. Oftentimes I am fearful of doing that which is new to me. Going hunting with folks that I don't know is intimidating for me. So I pushed myself and enjoyed my time! The guys I hunted with complemented me on my skills and ended the day with telling me I am a great guy. I thought it was funny. A bunch of hunting guys telling me I am a great guy and never once acting weird in anyway that my fingernails are painted quite brightly! Anywho... I had a full, but great weekend. I hope you all had a good time with whatever you chose to do! Sometimes a man's gotta do what a man's gotta do. Looks like you had a fun and successful hunting weekend. There will be time to flip the switch to pretty clothes and makeup. One of the things that I like about being a CD is the juxtaposition of my engaging in rough and tumble typical guy things to the sweetness, softness, splendor and beauty of getting my 'pretty' on. So true Pat. I thought to myself, how many times do I have to opportunity to dress vs. how many times have I been offered such a great hunt. Over the last few years, I have never been offered such a hunt, and I have the chance to dress all of the time! And I agree about the juxtaposition within our lives. So much fun, I just wish there was more time in life to experience more of it!